Why Institute? Network, Learn, and Grow at Institute! Join more than 2,000 early childhood education leaders, educators, teacher educators, administrators, advocates, and other early learning professionals in Long Beach to help each other grow and meet all of your professional development needs. Sharpen your skills by attending more than 200 diverse sessions that highlight the latest trends in early learning systems, administration, research, best practices, and much more! Five reasons to attend Institute •	Gain new skills and knowledge •	Build your professional network •	Learn from industry-leading experts •	Get inspired •	Experience Long Beach, CA We can’t wait to see you at Institute! Based on a three-year study, this session will share how leading countries conceptualize, design, implement, and evaluate services for young children and families. Focusing on a systems approach that addresses governance, finance, accountability, quality enhancement, professional development, family engagement, and transition, this interactive session will provide concrete examples of how diverse countries achieve early childhood services that are high quality, equitably distributed, efficiently organized and managed, and durably sustained. In recent years, practitioners have become aware of the role that racial microaggressions have on the learning, development, and success of young children. Microaggressions are common, daily verbal and nonverbal slights that negate the experiences of people of color. Participants will learn what racial microaggressions are and how they serve as a barrier to academic success for Black children. ECE counter-narratives will amplify strategies and practices that parents, teachers, and community advocates can use to reduce the prevalence of microaggressions. Participants will begin by completing self-assessment tools regarding dispositions, including relevant beliefs and values regarding culturally responsive practices in early childhood settings. Presenters will address current knowledge about how children learn languages and review relevant research leading to recommended practices for assessment, eligibility determination, and learning strategies for culturally, linguistically, and ability diverse students, with a focus on dual language learners and their families in ECE. This session will introduce two complementary approaches— anti-bias education and culturally sustaining pedagogy—to advance social justice in teacher education. Drawing on these perspectives, we offer practical strategies for the preparation and ongoing learning of preservice and in-service teachers. This session will support adult identity development, designing learning activities, addressing practical teaching dilemmas, navigating institutional politics, and teaching in online spaces. Opportunity will be provided for problem solving and action planning. Children who have been traumatized are often misunderstood by teachers. Whether the trauma is from abuse, neglect, disaster, or other circumstances, these children often experience and exhibit behavior which teachers may misinterpret are find hard to understand. This workshop will explore the causes of trauma, how to identify and work with trauma in young children. The focus will be on training teachers to set up appropriate environments and provide effective guidance for children who have experienced trauma. Power to the Profession is spearheading exploration of early childhood education’s future as a recognized field of practice. This session will enlighten participants about the results of Ontario’s successful effort to form ECE as a profession and explore differences with professions in the US. Learn more about professionalization by comparing Ontario’s model with US-based professions, followed by reflection and discussion about application of our “cross-border window shopping” for efforts to professionalize ECE as a field of practice in the US. Five steps for self-regulation for administrators, educators, and children: The awareness and skills to move from self-sabotage to self-regulation Using reflective activities and video vignettes, participants will learn about the five steps of an unregulated life that create a cycle of selfsabotage. Then they will consciously create a life blueprint of the five steps (and skills) to self-regulation that provide a bridge from problems to solutions in all areas of education, from administration to classrooms. Baby boomers to X, Y, and Z: Contemporary contexts across the generations in the early childhood profession— Finding common ground for solution-oriented outcomes Presenters representing a variety of generations and educational roles will share their workplace experiences and career aspirations. Topics of expectations, technology, communication, diversity and inclusion, mentoring, leadership, and norms will be explored. Participants will examine belief systems and be challenged to think beyond “the right way” to manage and lead in a changing early childhood landscape. This interactive session serves to cultivate a strengths-based approach to workplace and networking relationships. Schedule at a Glance For a detailed schedule of NAEYC’s 2019 Institute program, visit our website. Wednesday, June 5 Hours are subject to change. Pre-Institute Workshops Saturday, June 1 $199 for Standard and Premium members and $249 for nonmembers. Preregistration is required for all Pre-Institute Workshops. The Exhibit Hall is Back! Discover new ideas and solutions from more than 50 early learning companies while enjoying daily activities, demonstrations, and prize drawings. Catch a glimpse of the Exhibit Hall for the first time on Sunday at noon. Come back after your last session at 5:30pm for the ever-popular Exhibit Hall Networking Reception. Enjoy drinks, appetizers, old friends, and new faces. On Monday and Tuesday starting at 10am, visit for networking activities, learning labs, and play! Thatâ&#x20AC;&#x2122;s right! Back by popular demand, the Ping-Pong Challenge will return! Simply collect colored Ping-Pong balls from exhibitors on Monday and Tuesday to exchange for raffle tickets. Catch it while you can. The Exhibit Hall closes on Tuesday at 2pm. Register Now! You like to save money, right? We all do! Act now! Registration fees increase after May 3. There are three ways to register: online, via fax, or by mail. For more information about registration, visit NAEYC.org/institute/2019. Discover Long Beach Long Beach is a pedestrian friendly location ideal for shopping, dining, culture, and entertainment when you’re not engaging in vital professional development. You could even get special offers and discounts when you present your Institute badge at various Long Beach businesses and attractions. Here are a few suggested sites to check out when you arrive. Queen Mary The Queen Mary is one of Long Beach’s signature attractions, a piece of world history that attracts visitors from around the globe. The Aquarium of the Pacific The Long Beach Aquarium of the Pacific offers a “face-to-fish” encounter with its more than 11,000 inhabitants of the world’s largest ocean. Boasting 11½ miles of sandy beaches, inland waterways, and bays, Long Beach is the ultimate year-round playground. In the heart of downtown is the enticing Restaurant Row, with dozens of restaurants offering cuisine from cultures worldwide. You can save money by becoming a Standard or Premium level member! Join today! *Allow a 48-hour membership processing period to take advantage of member rates. Register Now! There are three ways to register: online, by fax, or by mail. 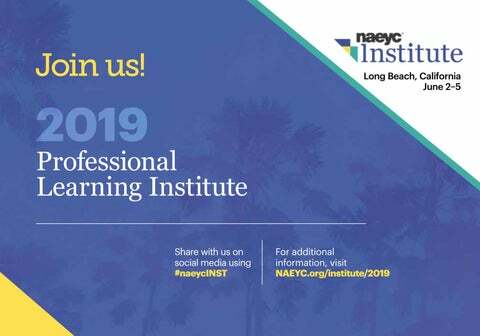 For more information­—and to register—visit our website NAEYC.org/institute/2019. Register Now! 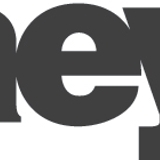 Join the Online Conversation! This year's Professional Learning Institute is June 2-5, in Long Beach, CA!